Our Capoeira classes in Toronto heavily incorporate music, as it is one of the fundamental aspects of Capoeira as a whole. Without music, there is no Capoeira as the saying goes. 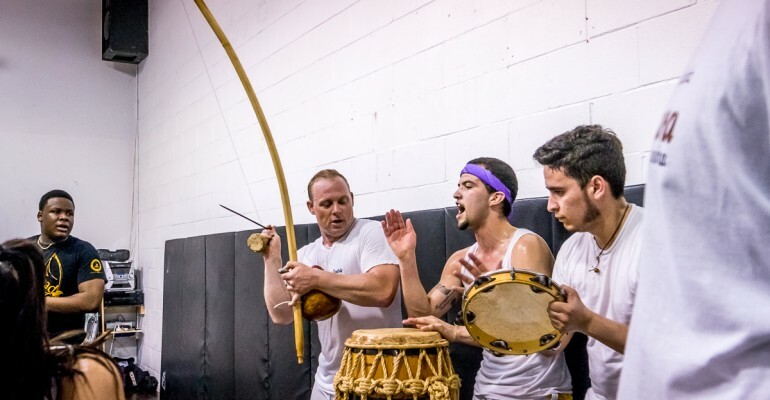 Our Capoeira classes in Toronto include learning Capoeira instruments, rhythms, and songs. Music is a very important aspect of Capoeira because it sets the tempo of the game and determines the style of play. The tempo ranges from the very slow to very fast rhythms. The songs that accompany these rhythms are numerous and vary from group to group. Some groups have their own songs; others sing the very popular ones while some Mestres even like to improvise songs in a roda. They can cover a range of topics from stories about capoeiristas and Mestres to stories about life, love, morality, game tactics deceit and bravery. The instruments are played in a row called the Bateria. The rhythm of the Bateria is set by the Berimbaus (stringed percussion instruments that look like musical bows). 3 types of berimbaus are Gunga, Medio and Viola. They vary in size from a large gourd to a small one and produce deep, medium and sharp sounds respectively. Other instruments that are featured in the Roda are the Pandeiro (tambourine), the Reco-Reco (rasp), and the Agogô (double gong bell). The Atabaque (conga-like drum) is a common feature in most Capoeira Baterias. Many cultures use Music and Song to tell their histories, to teach morals and to inspire their people. The rhythms and music of Capoeira range in tempo from the very slow sounds of Angola to very fast rhythms of Sao Bento Grande de Bimba (regional). Mostly sung by Angola schools a ladainha is a solo usually sung by the most senior capoeirista present. A Ladainha can vary in length and subject matter, but are almost always metaphorical and include a moral lesson, story, history or mythology. They can be improvised to suit a particular occasion or structured like perfect poetry. When the ladainha is finished a soloist calls on the crowd to respond to a number of salutations, sung to show respect and gratitude to their masters, teachers, capoeira itself and to God. These expressions of thanks and reverence are known as the louvação however, they are also referred to as a chula. After the louvação the lead singer will begin the corridos. These are a group of songs that are typically short calls and short responses. The chorus is often the first line sung in the song. This chorus is repeated over and again between the verses sung by lead singer to share a story or message. The quadras are an innovation of the late Mestre Bimba. He would sing these in place of the ladainha to be followed by a louvação. There are many quadras written like corridos where the lead singer will sing four lines followed by a choral response. In Capoeira, the singing of songs and the playing of music is just as important as fighting or learning of the movements. To be a true capoeirista, one must be able to sing, play the instruments (berimbau, atabaque, pandeiro, a-go-go and reco-reco), know the movements, and participate in the Roda. Eu querro passar, Areia. Areia do mar, Areia. I want to pass, Sand. Sand of the sea, sand. Eu vi relampue eu vi relampiar. I saw I saw relampue relampiar. Vim da Bahia pra lhe ver, vim da Bahia pra lhe ver .Vim da Bahia pra lhe ver, pra lhe ver pra lhe ver, pra lhe ver, pra lhe ver. How ya doing, how ya doing? Ms Maria, how do you do? How are you doing, how is it going? Ms Maria, how ya doing? Remember the teachers who now estam with God ..
Que você e minhá vida, ai nunca vou te deixar! You are my life, there’ll never leave! Tá com a cabeça quebrada. É de uma boa palmadas. is with the broken head.